The flywheel is located on the output side of the crankshaft. It establishes the connection between engine and clutch. The flywheel ensures smoother running of the engine. By the rotation of the crankshaft, the flywheel can store kinetic energy. Due to its mass inertia, it can continue to rotate, even when, at certain times, the engine does not supply any operating power. The flywheel takes up the clutch. Together they build the flywheel mass. On the outer diameter of the flywheel is a ring gear, into which the starter pinion engages when the engine starts up. The teeth of the ring gear are specially heat-treated (hardening / tempering). This ensures a long service life. In many cases the teeth of the gear are equipped with an inlet bevel to ensure better engagement of the starter pinion. On the outer diameter of the flywheel are markings to fix the precise ignition point. The receiving diameter of the clutch housing is produced with a very tight tolerance, in order to ensure the centring of the coupling. 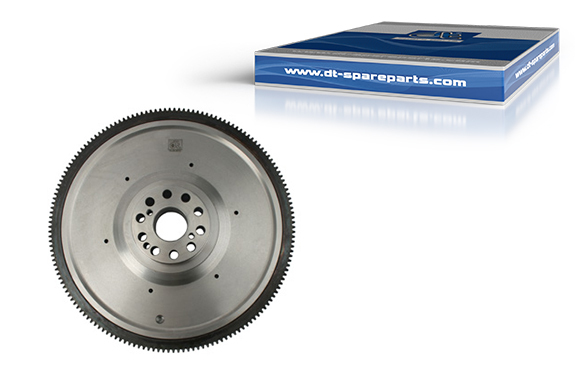 The friction surface of the clutch disk is produced with a highly accurate run-out tolerance. In addition to flywheels, the comprehensive DT range includes all matching ring gears, ball races, bearings, starter pinions and flywheel housings.